You’ve probably heard it said before that building and maintaining muscle mass is one of the vital parts of a healthy body, and that it should be a goal in any well-rounded fitness program. But have you ever wondered why? What’s so important about building muscle, and why isn’t cardio enough? Or, Ladies, have you ever thought, “why not just stick with my cardio classes that I enjoy so much? Cardio is fat burning, right?” Maybe you understand that there is an important difference between cardiovascular exercise and strengthening exercise, but don’t know how to explain why you’re including it in your program. Here, very simply, is what makes muscle tissue so uniquely special. These are the main reasons why building and maintaining muscle is extremely important, and what it has to do with getting and staying fit. Finally, I’ll give you suggestions on how and what basic weight training exercises you can perform at home or in the gym that will get you started on building muscle mass evenly throughout your body. How Does Muscle Mass Aid in Weight Management? Muscle increases metabolism. It’s metabolically active tissue, and takes more calories to sustain itself than fat tissue. The body burns more calories daily to maintain one pound of muscle than it does to maintain one pound of fat. Muscle mass burns about 6 calories per pound while fat mass burns only 2. This is because muscle mass doesn’t just sit there annoying us like fat mass does, it’s more metabolically “alive” than fat mass. This is especially evident after an intense workout as the body recovers. Here are the reasons why. After an intense workout, especially an intense weight training workout, the body’s demand for oxygen is greater than before the workout. This is when the body is experiencing EPOC, or excess post-exercise oxygen consumption also known as the “after burn” effect. This after burn effect or EPOC is when the body continues to burn calories for hours following a workout as it returns to its resting state. As your body recovers from an intense workout, it needs additional oxygen. The need for the increased oxygen takes energy, which means that the body continues to burn calories. The body will expend more calories as it returns to its pre exercise temperature, breathing and heart rate, and as the body repairs the tiny micro tears in muscle fibers caused by weight training. Of course, studies have shown that the intensity and duration of the workout is directly related to EPOC or “after burn” effect, and how long it will last. Body composition is how much muscle vs. fat within your body. If you’d like to determine your own body fat percentage, you can easily perform a simple body fat measurement test. More muscle mass means less fat mass. Because muscle is a more metabolically active tissue, it takes more energy to exist. This means that the more muscle mass you have, the more calories you’ll burn daily. Muscles are hungry and are better at burning and using those calories. We know that excess weight leads to many life threatening health problems, like type 2 diabetes and heart disease. If you’re fat mass is decreased, and your muscle mass is increased, you will substantially reduce your risk of debilitating illness and early death. Of course, there are many more benefits of muscle mass, but simply put, these are the specific, amazing ways that muscle will move you toward reaching and maintaining optimum health. Weight training has long been proven to build muscle mass, and can be done with equipment like dumbbells, band, cables, and weighted medicine balls or just your own body weight. Always begin by practicing the movement without the added weight. When you’ve perfected your technique, add light weights, finally progressing to “moderate” weights. Exercising with a certified trainer will help you to determine what’s safest and best to get you specific results more time efficiently. The following are five resistance exercises that will help you to begin building muscle. These exercises will work the upper and lower body, target the major muscle groups, and activate opposing muscle groups. Perform these with a neutral spine, with your shoulders pulled back and down. Eventually add up to 10 exercises. Here’s a brief summary of what these muscle building exercises do, and how they will help you build muscle mass evenly throughout your entire body. The squat will strengthen the entire lower body musculature and activate the largest muscle groups in the body, the gluteals, quadriceps, and hamstrings which will maximize your calorie burn. The basic biceps curl ending with palms facing upward, in a supinated grip, will build all biceps muscles in the front of the upper arm and also work your forearm. In an isometric contraction of your entire body, the plank focuses on strengthening your core, specifically the deepest core muscles and those that protect your spine like your transverse abdominis, internal obliques, and the deep erector spinae muscles, like the multifidus. The push-up will challenge and strengthen the deep core muscles like the plank, but will emphasize building muscle in the chest, shoulders, and the back of the upper arm, the triceps. And finally, the row will strengthen the muscles in the back that retract the shoulder blades, the back of the shoulder, as well as activate the biggest calorie burning muscle in the upper body and back, the latissimus dorsi. So, what does this mean for you and your exercise program? It means you should regularly activate your muscles and EPOC to manage your weight. It also means that you should not focus on only cardiovascular exercise to burn fat. Even though cardio exercise burns more calories during the workout, weight training workouts continue to burn calories several hours after the workout; something steady state cardio does not do. We need both weight training and cardiovascular exercise to maximize fitness. 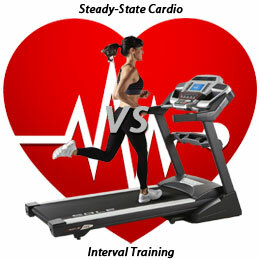 Many people, women especially, often only focus their time on cardio machines and cardio classes. What we Ladies should do is see weight training as our highly effective secret weapon to achieve our goal. By building more muscle mass with intense weight training and activating it properly with regular weight training workouts, you’ll be able to use your muscle to your advantage to keep those extra calories from being stored as fat. Regularly change the exercises, body positions, move in all directions, change foot positions, and handgrips to change the muscles targeted. Use a resistance weight which will force you to work very hard to complete the last two repetitions; intensity is absolutely key to activating EPOC “after burn” effect. Be sure to check out our exercise video library, and consider hiring a fitness professional. Now you know what amazing things muscle mass does for the body, and how you can use it as a powerful tool for weight loss. Always remember to combine exercise with healthier food choices. Regular intense weight training will increase your muscle mass so you’ll ultimately increase your resting metabolism, and you’ll burn more calories, even at rest. Dedicating time and attention to building muscle mass through weight training is an important piece of the health and wellness puzzle not only for getting fit, but also for maintaining fitness for life. Now, go activate your own personal secret weapon in weight management: Your Muscles! 1. Reynolds, J.M. & Kravitz, L. (2001). Resistance training and EPOC. IDEA Personal Trainer, 12(5), 17-19. 3. Delavier, F. (2006). Strength Training Anatomy, Second Edition. Champaign, IL: Human Kinetics. 4. Earle, E.W., Baechle, T.R. (2004). NSCA’s Essentials of Personal Training. Champaign, IL: Human Kinetics. Ideal Body Weight: What does it mean?